Encourage your creativity in using and applying Talking Mats in different situations such as goal setting, sharing views, supporting disclosure, enabling decision making…..the list is endless! However, you cannot train others unless you have completed and passed one of our residential ‘train the trainers’ courses. We put significant emphasis on our accredited training because without it, the quality and integrity of the Talking Mats framework is diluted and damaged.Talking Mats is based on extensive research and although it may appear simple, there are many complex layers involved in using it and we need to be confident that trainers have an in depth knowledge and understanding of these. 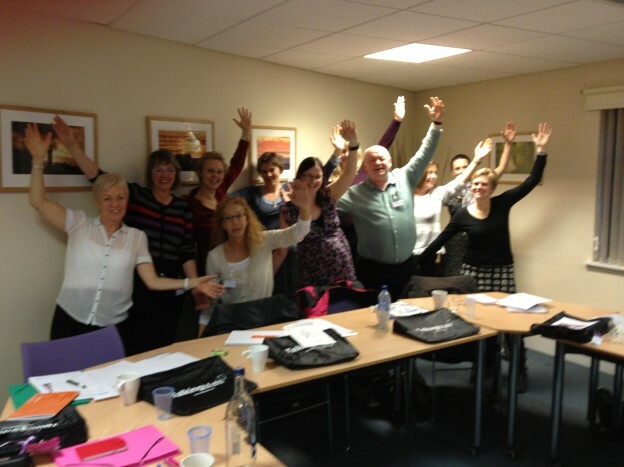 In order to apply to become a Talking Mats trainer you have to have completed the standard training (above), be experienced in using Talking Mats and fulfil the course requirements. Talking Mats was originally developed at University of Stirling and the Intellectual Property is held by the University and Talking Mats Limited is assigned the sole rights to Talking Mats. Talking Mats is registered as a trademark. Only training that is sanctioned by us is recognised and anyone training others without being a recognized Talking Mats trainer is infringing Intellectual Property and copyright. We are of course delighted when people share their knowledge and experience of Talking Mats and signpost others to the website and resources. This entry was posted in AAC, Blog, Communication difficulties, Research, Talking Mats principles and tagged AAC, Communication difficulties, Research, Talking Mats, Training on October 30, 2013 by Joan Murphy. By Dr Norman Alm, School of Computing, University of Dundee. 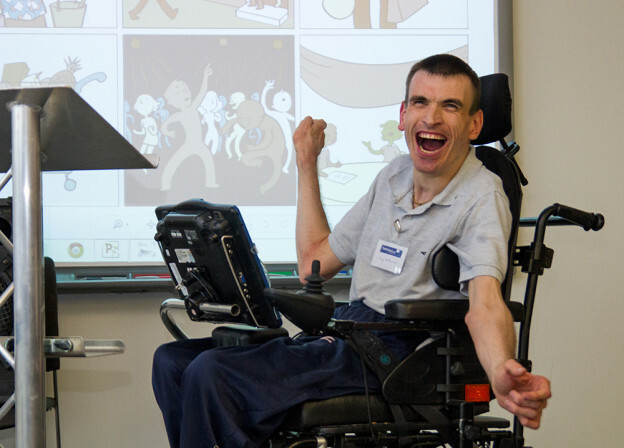 Have been thinking for some years – and having dialogues with Joan Murphy – about this : would it be possible to come up with a new type of AAC where both the non-speaking person and their communication partner(s) were equally in joint control of some sort of system? Imagine a touch screen which also could be controlled by switch input. A non-speaking person and their communication partner are both engaged with the screen and both equally making use of it to do … what ? Don’t know at the moment, but there are several suggestions for ways to explore and develop this idea further. Talking Mats is one. The purpose is to help the person with communication difficulties express their opinions, with the other participant being a facilitator. But notice what is not happening – a face-to-face interview. Instead both participants look away from each other and focus on the mutual task, manipulating the symbols on the mat to produce the communication. Much less stressful – and much more enjoyable and productive. 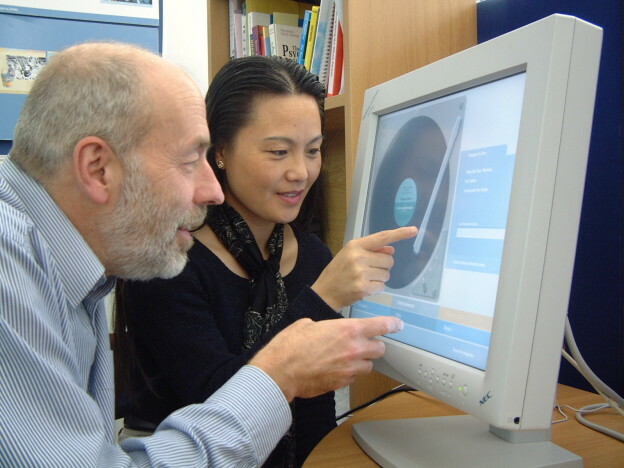 Another example is the CIRCA system, which supports what is usually problematic communication between a person with dementia and a carer or relative. The support takes the form of touchscreen access to an engaging multimedia display of reminiscence material drawn from public archives. Again a potentially stressful and unproductive face-to-face encounter is converted into an enjoyable mutual activity that flows effortlessly. The design of each of these systems taps into something powerfully motivating. Talking Mats lets the person describe their emotional reactions to a subject, as manifested by the scale which organises the elements on display into a snapshot of that person’s individual feelings. CIRCA makes use of the one faculty still operative even in quite advanced dementia – the ability to recall long-term memories and enjoy sharing them. Both these systems offer a structured communication encounter in which the structure has the effect of not restricting, but freeing up the communication. Crucially ( I would argue) both free the participants from the direct responsibility of keeping the interaction going and let them share that responsibility with a third agent. This entry was posted in AAC, Blog, Communication difficulties, Dementia, Participation and tagged AAC, Communication difficulties, Dementia, Participation, Talking Mats on October 25, 2013 by Guest Blogger. Hello everyone, my name is Greig McMurchie and I would like to take the opportunity to welcome you all here today. If I look familiar it may be because you recognised me from the original talking mat video, where I had a cameo appearance with the lovely Joan murphy of course that was over ten years ago, and back then I was much younger and better looking. Joan however is still as lovely as the day I met her. As you can see, I have been involve in talking mats for many years now, ever since Joan asked me to help her trial a new communication system, that she and her colleague Lois had been developing. My initial thoughts were wow, this sounds really complicated and I was a little bit scared. But I had known Joan since I was little and I really wanted to see what this new Communication system was all about. When Joan came to visit me at that Dundas day center, all those years ago, all my fear quickly disappeared, it was really easy. I was able to have my say, and because it was visual I could change my mind also. I began using talking mats to share my views, opinions and wishes, and before long this system was helping me to make life Changing decisions, such as what I wanted to do with my life once I had finished my college course. In fact you could argue that I am where I am today because of talking mats. And I like to say I wouldn’t have it any other way. Anyway, that was away back then, and times have move on. About four weeks ago Joan and Lois came to Upper Sprinlands to visit me, and of course show me their wonderful bran new talking mats app. My initial thoughts were this sound fantastic, and when they arrived we had a wee chart and they explained what they had been doing. I don’t know about everyone else, but when I was a kid a tablet was something you took if you were not feeling too well, an android was a character from a computer game and an apple was something you gave to your teacher to butter them up if you forgot to do your homework. But today all this modern technology is making it easy for everyone to engage creating doorways to all kinds of wonderful stuff. And boy can I say this new talking mats app is all kinds of wonderful. So after we chatted I got to have a wee play with the new app, I couldn’t believe how easy it was, you were able to just move the pictures around and place them were you want them on the screen. The New picture sets are fantastic, they are bright colourful and easy to understand. I also like the way you can enlarge the picture to make it easier to see. And of course the fact that it come already to use. You can even take a photograph and send it to yourself by email. No more printing, cutting out and Velcroing, no more hunting for the camera only to realize the batteries are flat and you can’t use it anyway. Everything is just nicely packaged. And the fact that it can be used not only on an Ipad but also on a computer makes it even more accessible. Dare I say I personally felt the new App for me was even easier than the old system; it is quicker, fun and very cool? Now I just need to persuade Upper springland to Purchase a copy or twelve. 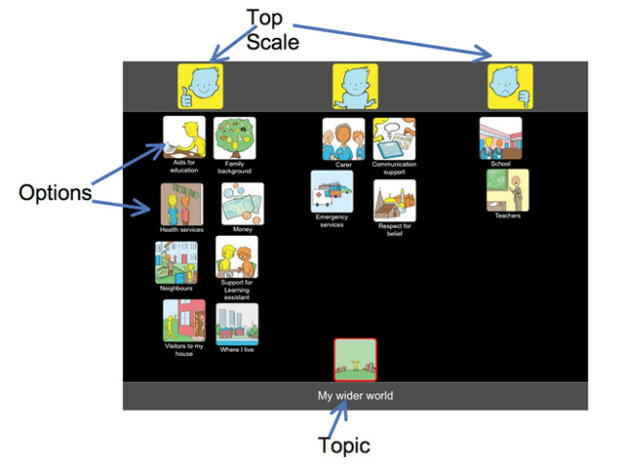 This entry was posted in AAC, App, Blog, Communication difficulties, Digital Talking Mats, Event, Personalisation, Self directed care and tagged AAC, Talking Mats on October 18, 2013 by Guest Blogger.